The cheapest water purifiers available in India are the cartridge type water purifiers. These water purifiers are good for use with municipal or corporation supplied tap water. Common pore sizes for water filter cartridges range from 20 microns down to 1 micron. One micron is one-millionth of a meter. The micron rating of a water filter represents the pore or hole size of the water filter. Thus if a water filter cartridge is of 20 microns it will trap all particles in water which are larger than 20 microns. Similarly a 1 micron cartridge will trap particles in water that are larger than 1 micron. Since size of smallest bacteria and virus in water is about 0.2 microns, the commonly available water filter cartridges cannot be used as a water purifier to prevent water borne diseases. For bacteria and virus removal from water, only membrane type water purifiers are effective as explained on our page about Membranes. Cartridge filters can be used on Municipal and Corporation supplied tap waters, since they are chlorinated, and do not have any bacteria or virus in it. The purpose to use cartridge type water purifiers in Municipal tap water is to prevent rust and mud from water. 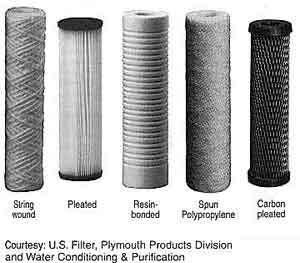 To explain what are water filter cartridges, we can compare it to a piece of cloth used to filter water. So water filter cartridges are a filter media, just like a cloth when it is used to filter water. Water filter cartridges can be simple filter media with filter paper or made by winding cotton rope around a central core or other media as explained below. The most common and cheap filter cartridges are the cotton string wound cartridge filter. The next most popular cartridge filter is the pleated paper cartridge filters made with folded filter paper. Then there are melt blown cartridge filters which are made by blowing air through molten plastic. Spun Polypropylene cartridge filters are similar to the cotton wound cartridge filter, but polypropylene string is used instead of cotton string. 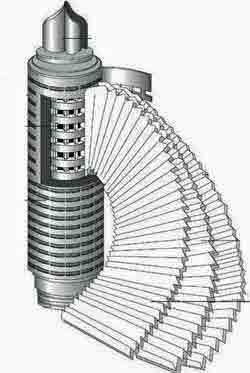 Other types include the carbon block filter cartridge. Now it is common to find many types of Multipurpose water purifier filter cartridges. These multi-layered water filter cartridges have for example a pleated paper filter element on the outside and filled with granular activated carbon. So it is actually two water filters in one. The outer pleated element removes suspended solids and the activated carbon removes the chlorine and bad odours in the water. Similarly there are many other combination water filter cartridge available in the market. These types of combination water filter cartridges are widely used in the popular water jug with filter like Brita water filter jug or pitchers. Water filter cartridges, over time, gets blocked when it filters out the dirt from water flowing through it, so water filter cartridges must be replaced at regular intervals, otherwise the flow through the water filter gets blocked. The filter cartridge usually come in standard sizes in multiples of 10 inches long and either 2.5 inches in diameter or 4 inches in diameter. So the smallest standard size water filter cartridge is 10 inch long and 2.5 inch in diameter and the largest standard size water filter cartridge is 40 inch long and 4 inch in diameter. In India, since we follow the metric system, they will convert these inch size cartridge measurement into mm. Even though the standard size mentions the water filter cartridge as 10 inches long it will not be physically exactly 10 inches long but around 9.75 inches. This is to fit inside the 10 inch filter housing as per international standards. The water filter cartridges explained above has to fit tightly inside a water filter cartridge housing. Most of the domestic water filters available in India are made from plastic material, some made with transparent polycarbonate material. Below we have a picture of the most common types of in-line water filter cartridge housings. The picture shows filter cartridge housings for the most common standard 10 inch water filter cartridge. Pleated water purifier Filter cartridges are usually made of special type of paper which has been folded or pleated and then formed into a circular shape of the filter cartridge body as shown in the figure here. Since the pleated water purifier filter cartridges have a large surface area it can filter more water without getting clogged or blocked quickly and is longer lasting than most of the other cartridges. Several sizes of pores are available in this type of cartridge, the most popular size being 1 micron absolute, 5 microns, 10 microns and 20 microns. The most common size of the pleated cartridge is 2.5 inches in diameter and 10 inches in length. The same 2.5 inch diameter cartridge can also come in lengths of 10", 20", 30" and 40 Inch size. Similarly there are larger pleated filter cartridges available in 4 inch diameter and lengths of 10", 20", 30" and 40 Inch size. The longer filter cartridges have longer filter housings to fit these cartridges. Pleated water purifier filter cartridges are the preferred cartridges since they last longer and also because they are more reliable in filtering to the desired sizes. Other cartridge filters like the yarn spun filter cartridges cannot guarantee filtration to a particular particle size.